SINCE I TOOK RICE DURING THE DAY, I did not feel like taking rice again in the evening. Lazy to go out to buy my dinner, it was raining actually by then and suddenly an idea came to my mind. 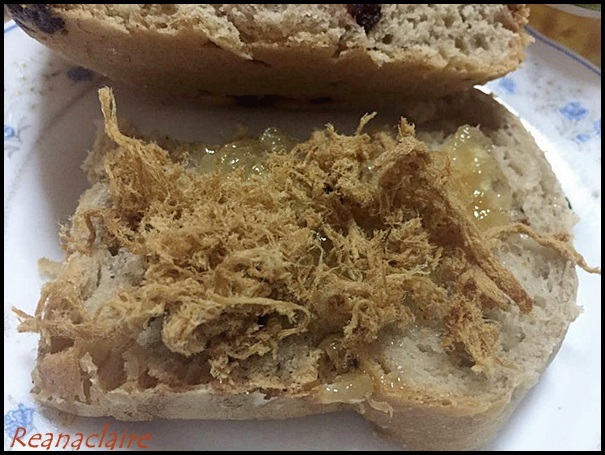 Bake Bread la! 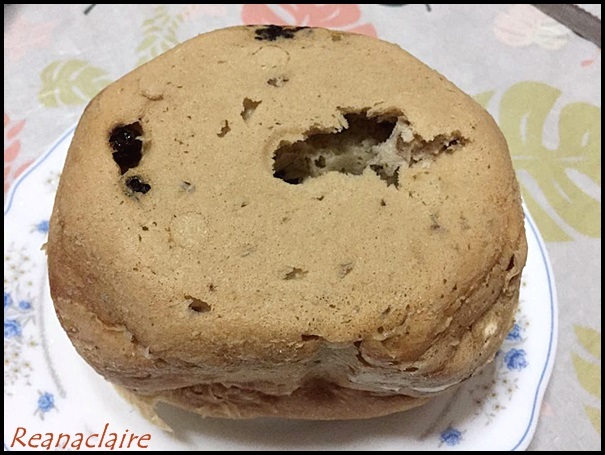 Yes, I have failed twice last week, they turned out to be like cakes instead of bread, I wonder why.... this time I did not want to follow the recipe from other sources but follow strictly to the Khind instructions and recipes given. OH, OH.... why got hole??? No worries, who would want to look at the bottom anyway, right??? Lots of holes in between caused by my overfeeding of dried fruits and walnuts! And as if it is not enough, I added in Chicken Floss as well!! So nice. 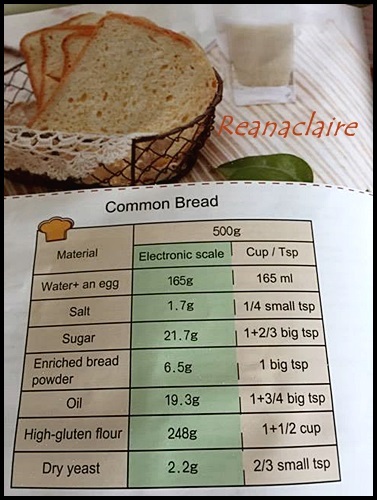 Make own bread and eat it. Well done Claire!! Wahhhhhhhh!!!! Really getting into it these days, eh? Good, good. Keep it up! Not bad, not bad, this time jadi lah. As long as can eat, OK already. Can la.. but don't keep overnight..
Really good! You don't have to buy bread anymore. 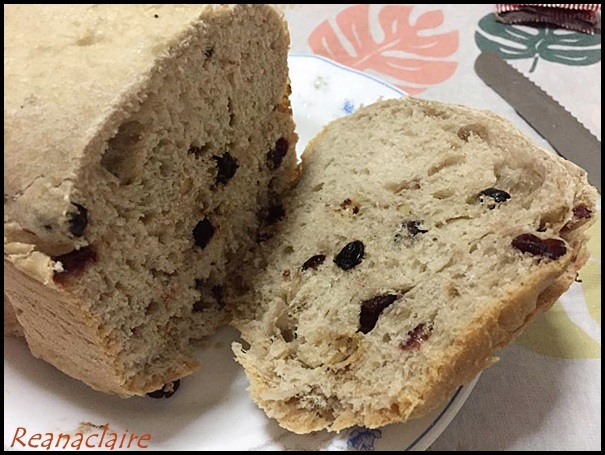 Homemade bread is always better because you can add in your own nuts and fruits. Next project will be making coconut jam? wahhh..never thought of it leh.. 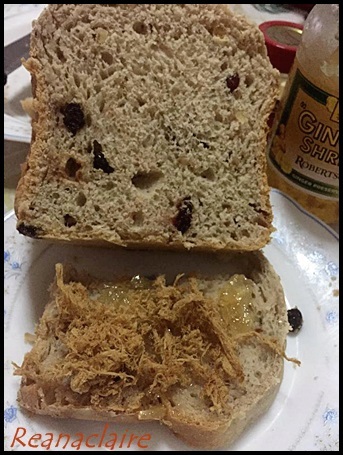 I like coconut jam too... ok, we try one day, eh.. 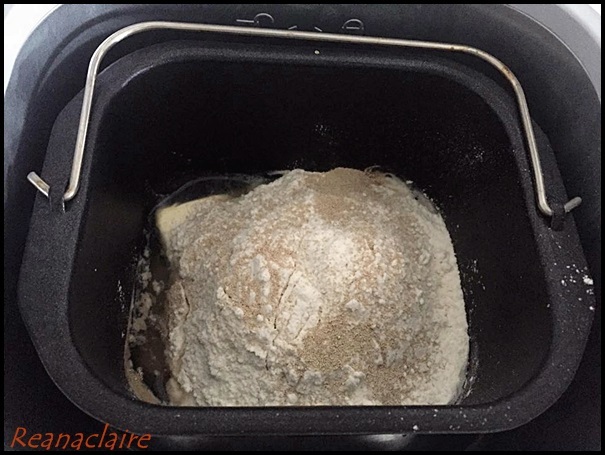 I love the smell of freshly baked bread at home. 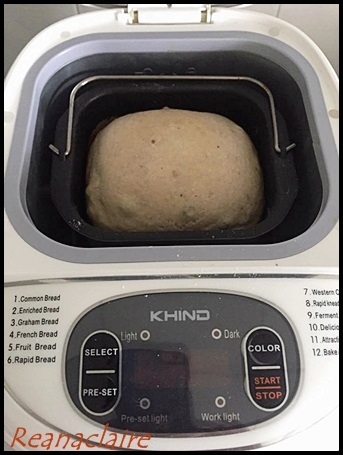 Breadmaker is a really useful tool to have. 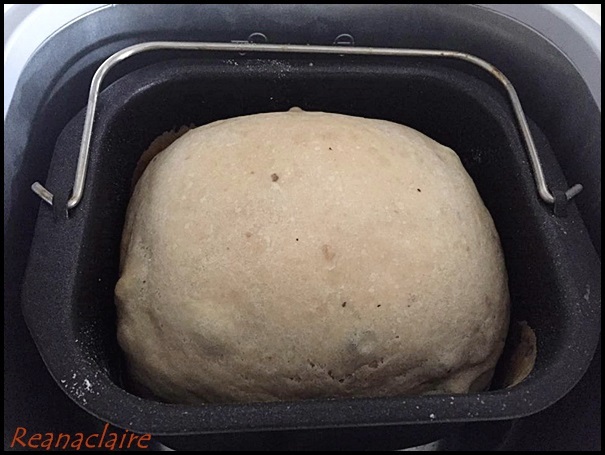 From your picture, I think you put a bit too much yeast and baking powder. Also not too much oil if you bake a bread than cakes. I did that before. Add the dried grape if you wish or oats. if you find the blended product too dry just add in bits of water. 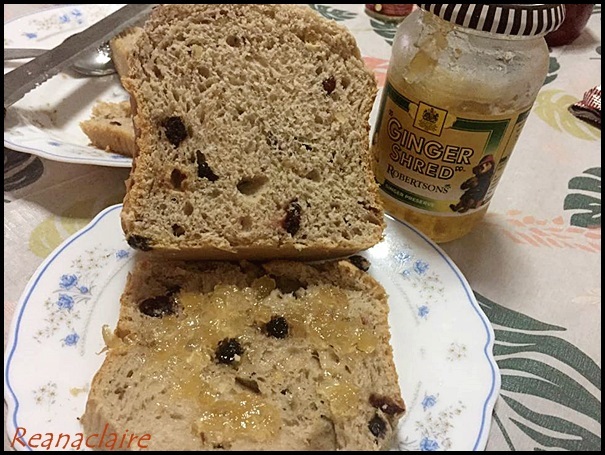 If too much margarine or oil, your bread sure turns out like cakes! hahaha.. I did that many times. But not bad to eat too, right? Oh then I must cut down on my yeast.. it put there 2/3 tsp.. Ok, thanks for your useful tips! So I must cut down on oil too.. no wonder it turn out more like cake.. hahhaa..
Looks good. I would gladly eat it. 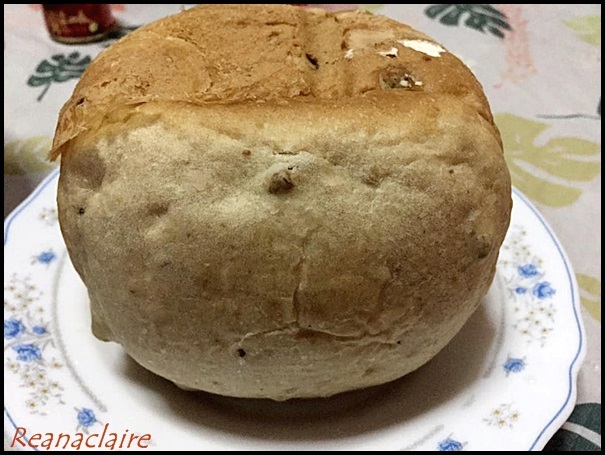 You just made me hungry and greedy for such thick loaves! 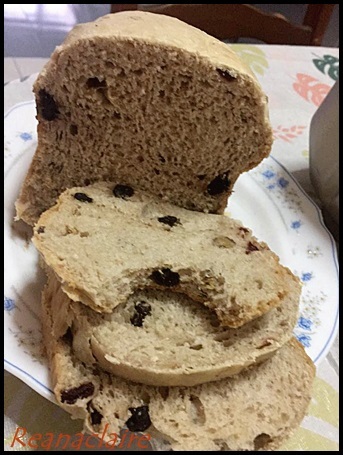 I must ask my wife to bring out our bread maker again.